A catalogue of safety problems allowing the Grenfell Tower fire to take hold have been indentified in reports from five experts for the blaze inquiry. Dr Barbara Lane says a "non-compliance" culture had existed with basic fire measures missing or "inadequate". The reports suggested cladding was incorrectly installed, and the primary cause of the "catastrophic" spread of June's fire, which caused 72 deaths. The inquiry also heard the fire service advice to residents to "stay put" in their flats had "effectively failed" within around half an hour of the blaze starting. The reports have been published at the start of the fact-finding stage of the public inquiry. The hearing was played the audio of the first 999 call made on the night, by the tenant of flat 16 on the fourth floor - where the fire started - Behailu Kebede, who survived. In it he told the operator: "Quick, quick, quick. It's burning." A montage of video sent in by the public of fire, showing burning debris falling from the tower was also shown. "Oh my god," says one woman , while another could be heard crying as the fire became out of control. Dr Lane said: "The building envelope itself was therefore a major hazard on the night of the fire. "The active and passive fire protection measures within Grenfell Tower were required to mitigate an extraordinary event. As a result, the consequences were catastrophic." The fire service had to pump its own water into Grenfell Tower - the building's "dry fire main" system was "non-compliant" with guidance at the time of construction and was "non-compliant with current standards"
When the fire was first reported at 00:54 BST, residents were initially given the advice to "stay put" inside the building. In her report, Dr Lane said this advice had "effectively failed" by 01:26. A change in policy recommending residents try to leave was not made until 02:47 BST, one hour and 53 minutes after the first emergency call. Prof Jose Torero's report said a "stay put" strategy was appropriate while the fire was only in flat 16, but not once the fire started to spread up the building. He said that after the fire had breached the flat - the "second phase" - it would have been better for residents to have left their flats and exited the building. Grenfell Tower was built in 1974 of reinforced concrete with a clear fire safety feature in mind. In the event of a fire in a flat, the design of the building should have prevented it spreading. Concrete, after all, does not burn. This is called "passive fire protection" and experts say there is absolutely nothing wrong with it. Very few people (before Grenfell) died in a tower block fire which spread from one flat to another. But today's detailed expert reports suggest that since 1974, the major changes to the building entirely destroyed that protection. Though these are early findings, which the inquiry will test, the key theory is that the design of the new windows, surrounded not by concrete, but stuff which burns, offered a way for the fire to break out from the flat to the rest of the building. Dr Lane's report said cladding on Grenfell Tower did not comply with recommended fire performance. A newly-installed kitchen window did not have fire resisting cavity barriers and was surrounded by combustible material within the cladding system, and this is thought to have been the "primary cause of the early stage of the fire spread", she added. "The assembly failed adequately to resist the spread of fire to an extent that supported the required 'stay put' strategy for this high-rise residential building," Dr Lane said. 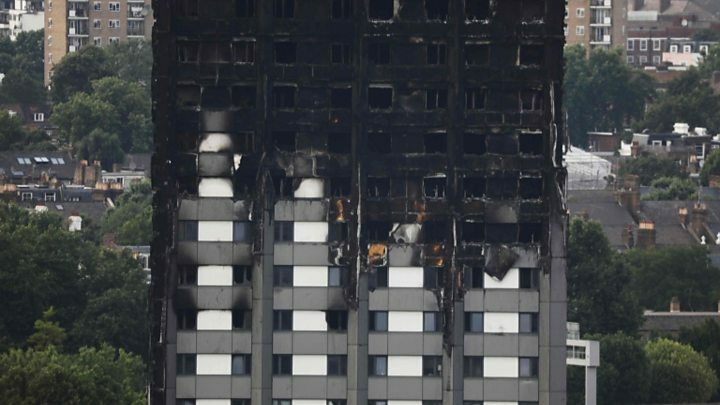 While attempts had been made to construct fire stopping compartments within the cladding, she said they were "installed incorrectly, and no evidence has been provided that they were ever tested for performance in the type of cladding installed at Grenfell Tower". Police had previously said the fire had started in a fridge-freezer. But Prof Niamh Nic Daeid's report stated that while the fire began in the south-east corner of the kitchen in flat 16 and there was "insufficient" evidence to determine the exact cause. She said the origin was more than likely to be "in and around" the fridge-freezer but the "cause of the fire remains undetermined". Prof Luke Bisby said there was currently "insufficient evidence" to support the view the fridge was the cause "even based on a balance of probabilities... and to exclude all other potential sources of ignition". His report also said the evidence strongly supports the hypothesis that the polyethylene material in the cladding on Grenfell was the primary cause of the spread of the fire. He said the polyethylene sandwiched between aluminium is highly combustible and melts, drips and flows at elevated temperatures and using this type of cladding on buildings should be carefully considered as it represents a "clear and significant" fire hazard. The report quoted the first firefighter to enter the flat, Daniel Brown, who said: "I walked towards the fridge to inspect it... immediately I noticed little pieces of hot embers/debris falling outside what I could now see was a window that had completely given way leaving a hole in the wall." Having already heard seven full days of tributes to the tragedy's victims, the public inquiry, which is expected to last 18 months, has turned to the cause and spread of the fire. The reports include three studies of how the fire spread - including one examining the contribution of the highly flammable cladding and insulation which had been installed as part of a refurbishment. Another report considered the building's own fire protection measures, and another the safety regulations in place at the time of the tragedy. 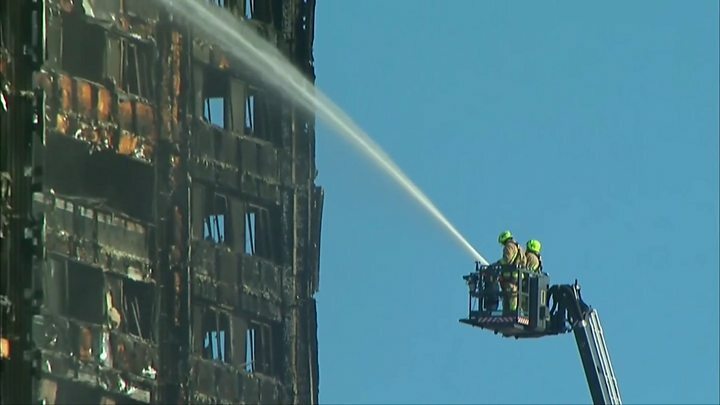 Richard Millett QC, counsel to the inquiry, said in his opening remarks: "The fundamental question which lies at the heart of our work is how, in London in 2017, a domestic fire developed so quickly and so catastrophically that an entire high rise block was engulfed". Grenfell United, the main organisation for bereaved families and survivors, said in a statement ahead of the hearing: "This is the beginning of a long road to justice." It continued: "It is going to be difficult to see some organisations trying to defend their actions, but we have trust that as the evidence emerges over the coming months, this inquiry will reveal the truth about how our community was treated before, during, and after the fire." Why was 'stay put' advice futile? Video Grenfell Tower inquiry: What questions will be answered?